Summary : Smaller and more discreet than some of the bigger V2 Cigs models, it’s time for the Ex Series to come under scrutiny. As you can see from the star rating, I was just as impressed. You can find out more in the V2 Cigs Ex Series Review. The original V2 Cigs EX Series review was published in July of 2015. A lot of the information, including starter kit contents + prices, was out-of-date. This information was updated in September 2018, along with a few additional thoughts. I tried the original V2 Cigs electronic cigarette many years ago when they were a much bigger brand in the US than they were in the UK. Since moving into the UK market, however, they have gone from strength to strength and are now one of the highest rated brands of e-cigarettes on review sites, on both sides of the pond. As a brand, they constantly evolve and the vape devices/models are constantly getting better, with newer and more technology/features. They are always changing things or tweaking things to make vaping easier. This makes it more enjoyable for people like you and I.
Cartridges have changed. Batteries have improved. They’ve added new designs and models to the collection, and rather than doing them quickly or rushing to get them out to the general public, they’ve taken their time. They create a masterpiece and then they let you try it. I think that’s what has made them so popular. In short, V2 Cigs is a brand that has picked up quite the following. When you get to grips with the e-cigs themselves, you’ll understand why. I will start by saying I didn’t like the website much. I found it to be far too confusing and fussy. They need to review it. But I can’t base my vaping experience on that, can I? [Updated Sept 2018:] They HAVE updated the website. It’s much easier to navigate now. Includes EX battery, USB charger, 5 x EX Series cartridges. You can pick the flavour and strength from a selection that includes Red, Gold Tobacco, Menthol, Congress, Green Tea Menthol, and Bold Leaf Menthol; and 0.0%, 0.6%, 1.2% strengths. Batteries come in various colours — black, opal, blue pearl, brushed steel and rose gold. Includes 2 x EX batteries, USB charger, wall charger/adaptor, user manual, 5 x EX Series cartridges. You can pick from the same colour, flavour and strength choices listed above, and both EU and UK wall adaptors. Includes 2 x EX-batteries, user manual, UK/EU wall adaptor and USB charger, carry case in various colours, and EITHER an EX Series cartridge sampler pack OR 2 x 5-packs EX Series cartridges. Includes 3 x EX batteries, user manual, lanyard, V2 power cig, carry case, travel (car) adaptor, wall adaptor, USB charger, 5 x 5-packs EX Series cartridges. This kit is a bit more expensive than some of the other starters kits on the market. I think that’s the same for quite a lot of the models they have to offer. For the most part, they ARE worth the price. Many of the devices that I have personally used have been long-lasting, durable, and do exactly what you’d want them to do … Sometimes, a little too much. Don’t forget you can save 10% with my exclusive V2 Cigs discount code: UKWORDGIRL. Both Dan and I have started using this model regularly, and he’s normally a fan of the bigger e-cigarettes such as the JacVapour Series-E, or the newly released V2 Cigs Pro Series 7. You’ll get two Ex Series batteries with 280mAh capacity batteries. You’ll also get a pack of five pre-filled Ex Series cartridges, and a wall adapter (UK or EU), a USB charger, plus a very smart looking box. [Updated Sept 2018:] I was impressed by the packaging back then. If I were to review it right now, I’d say that there was too much of it. We’re all recycling and trying to be eco-friendly now, ya know? One thing I will say about V2 Cigs is that their packaging is always spot on. It looks great – simple, sturdy and well-thought out. Not just that, it does the job. I’ve never had damaged items or broken bits. (Apart from a disposable once, but those are rubbish anyway…). The V2 Ex Series batteries are a definite improvement on the older style V2 Cigs batteries, for a number of reasons. Old style V2 Cigs batteries – manual, with a glowing tip and no LED lights. Firstly, they’ve gotten rid of that awful old-school look. There’s none of that orange ‘filter’ cartridge and white battery set-up. No big blue/orange/green/red light at the end, giving the game away. The whole thing is now sleeker, smoother, and works a whole load better too. The battery alone will cost you £16.25 for 250mAh Classic, £19.25 for 380mAh Classic, or £25.76 for EX Series, but you can use my discount code on those, too. It sounds expensive, and in comparison to some of the other brands, it is on the costly side. But there is a reason for this – a lot of technology has gone into the design and build of this e-cigarette battery. Your vaping experience is much better because of it. The battery is 10cm long, or 13.5 with the profiled cartridges attached. Obviously, the Ex Blank carts will make it a little longer. It sounds big, but it’s thin – about the same thickness as a regular cigarette, so it’s not too big and bulky,. This is unlike some of the other models offered in the V2 Cigs range. They have also added new technology which means that you get more puffs per battery which I can definitely say has worked. I would expect a 280mAh battery to give me between two to three hours of use, but on some days, I found myself getting more like four hours. Sometimes, even five before I needed to put it back on charge. For something so sleek, this one really does pack a powerful punch! It has all the battery power of some of the larger e-cigarettes, yet without all the bulky size that comes with it. The 5 LED lights at the end of the battery tell you how much of it is left. If you have four lights lit when you inhale, you have 4/5 bars of battery left. Each light is worth 20% of battery. If you’re down to one light, you only have 20% off your battery capacity left. At the same time, this helps when you are charging it up too because you can see how much longer you need to leave it plugged in for. You know that annoying thing you do when you’re staring at your e-cigarette charging up, hoping the colour will change soon so you can take it out of the charger and start using it again, and you need to leave the house… With V2 Cigs, you know how long you have left to charge. There’s none of that guesswork, and although it seems a little pointless, it’s actually something that just makes life a little easier. The good news is, with the V2 Cigs Ex Series you can have both pre-filled cartridges, blank cartridges to refill with your own liquid, and even blank tanks/carts. This means you can have a regular cigalike, or a tank-style e-cig, depending on how you feel. It’s actually a brilliant touch. I tend to use the tanks more often than the cartridges, but I do buy the latter every now and again. I always fall back on them when I lose a tank, break it, or need a new one. It’s handy to have the option of both. [Updated Sept 2018:] You can buy a range of tank/cartridge accessories for the V2 Cigs or Vapour2 EX Series. Classic cartridges will set you back £10.75 for a pack of 5, down from £12.99. The EX Series cartridges are a little more expensive — £13.95 for a pack of 5. You can buy them both in bulk, saving more money the more cartridges you buy — packs of 20, 40, 80, etc. If you’re not sure which flavour you’ll like, you can even get a 6-pack sampler. Again, the EX Series is a little more expensive (£14.99) than the Classic range (£10.75). You can use both styles on the batteries, though. We’re not done with the options yet. You can also buy empty cartridges that you fill with your own eliquid. A pack of 5 empty Classic cartridges is £8.75, or you can buy a pack of 40 for £49.49. If you fancy more of a tank than a cartridge, EX blanks (3-pack) are disposable (45-60 refills, website states) for £14.99. If you fancy dipping your toes into “wax vaping” (I have no idea), you can buy a pack of 3 wax-compatible tanks for £21.45. The Ex Series cartridges give you a window so you can see exactly how much liquid is left. It’s like a tank, but without the bulky size or mouthpiece. They’ve gotten rid of that filler ‘fluff’, too, which usually wraps around the centre of these carts. This is used to soak up the liquid to feed it through, but they’ve found a way to bypass this. Another great little touch. When that filler material goes dry and you inhale on it, you get a big mouthful of nasty. Yuck. The website states that you’ll get around 400+ puffs out of a cartridge, which would suggest somewhere between 15-25 cigarettes worth (depending on how you smoke), and I don’t think that’s a bad estimation. I reckon I got a full day’s use out of one pre-filled cartridge. That’s a lot better than most of the other cigalikes I’ve tried. There’s also a new airtight seal on these new cartridges, as well as being completely redesigned in look and everything else! This means they won’t leak. So far for me – no leakages! 5/5 cartridges isn’t bad…. So far. But for the purposes of this V2 Cigs Ex Series review, I’d say they were pretty much leak-proof. Moving onto the new blank tanks, and I think this a great move for V2 Cigs. Most vapers start with a cigalike and eventually move onto one of the bigger models, so the Ex series gives you a way to progress naturally from profiled cartridges to tanks, without even needing to buy new batteries to go with it. Plus, using the same batteries keeps things nice and slimline too. I told you – V2 Cigs are actually pretty great. They ACTUALLY listen to their customers, and they provide their customers with an electronic cigarette you can really rely on. What more could you ask for? You can buy a pack of three V2 Cigs Ex Blanks for £13.95 which is actually pretty cheap when you compare them to similar models. A replacement Vapouriz Lumina tank (which is size comparable to the V2 Cigs ones) is £5.99. Each V2 Cigs Ex Blank would be under £4.70. With my V2 Cigs discount code, would be only just over £4 each. Another winning point for this V2 Cigs Ex Series review! The tanks are only 0.9ml capacity. To be honest, it doesn’t make much of a difference to me. I don’t really mind that I would be refilling it more often than some of the bigger tank models. It’s easy to use – simply unscrew the mouthpiece and refill with liquid, being careful to avoid pouring it down the inner tube. That takes it right through to the mouthpiece. Trust me when I tell you that e-liquid does not taste pretty. The website states that you can refill the tanks around 20 times before they need to be replaced, but I would imagine I’ve refilled mine more than that and I’ve only just changed it. I’ve been using this e-cigarette for weeks now! The vapour does tend to die down before the throat hit, and when I got to just one LED light left on the battery, I found myself wanting to plug it back in. This seems to be the norm with many e-cigarette models these days – the more your battery dies, the lesser the vapour will be. Shallower puffs give you less vapour, making it more discreet to use when you are out and about. Obviously, bigger and deeper inhales will give you more. I like that about the V2 Cigs Ex Series. I’ve been a customer of V2 Cigs for many years, even before they were big in the UK when I lived in North America. I’ve always found their e-liquid to be great-tasting and pleasant to smoke. Oh, and I’ve never been let down by any of the e-cigarette models I’ve tried. The Ex Series has just put the cherry on the cake as far as I am concerned. I’ve only ever had a couple of problems with my orders. I had a couple of disposable e-cigarettes that didn’t work on arrival (although these disposable e-cigarettes are renowned for being a complete waste of time), but they were promptly replaced. On top of this, my orders have always arrived quickly and well packaged. It’s the little things that count, right? Honestly… There wasn’t a lot I didn’t like about the V2 Cigs, aside from the fact the vapour when you have less than 20% battery capacity left is a bit poor. That’s it, though. Oh, and perhaps the price could be brought down a little bit, but my exclusive V2 Cigs discount code helps with that, as well as recent price reductions. You get what you pay for in this industry, and there’s a reason some of the higher-priced brands like JacVapour and V2 Cigs are market leaders. They offer some of the best e-cigarettes. That’s my opinion anyway. Being able to mix and match cartridges for cartomisers, as well as all the handy little features, makes this a great device for newbies and more experienced vapers alike. Things like, the LED lights on the battery to tell you how much juice is left; and the windows on the cartridges so you can see how much liquid is left – these are all things that you would *wish* for to make your vaping experience easier. V2 Cigs have actually listened and given you this. It’s nice when you get what you want, right? I decided to grab the old V2 Cigs EX Series kit (or Vapour2) to see how they hold up now against some of the other, newer models. I have a massive jiffy bag filled with cartridges, so, I grabbed a few of them, sat myself down in front of a Disney movie, and started vaping away. Everything still works. Well, apart from one battery that doesn’t seem to want to do anything, but everything else still works just as it did when I last used it. I STILL like the way this cigalike vapes, although I do find the prefilled cartridges a bit … old-skool. They just felt weird to vape with now, but I haven’t regularly used a cigalike in a LONG time. If I were a smoker picking up a vaporiser/ecig for the first time, the EX Series would feel nice. Not too big. Not too small. Just right. When Vapour2 sent me their CBD eliquid to test out, they also sent me an EX Series kit (with an empty tank, not cartridges). At the time, Mister best-ecig was all over it and actually used it pretty consistently for a few weeks. I haven’t tried CBD eliquid in that many other devices yet, so I don’t really have much to compare it to, but I do really like the way the way that particular CBD eliquid vaped in this device. Price-wise, I think this is on the higher end of the spectrum and probably out of the price range for many. But I have a few Vapour2/V2 Cigs devices that I use on a regular basis, such as the PRO Series 7 and Trinity, and I can personally vouch that they are long-lasting and super durable vape devices that really do last for a long time. Some of the batteries I used for this update have been in a box since 2015 and they’re still fully functional. The cartridges are out of date now, but they still taste alright. And I haven’t died from something out-of-date-eliquid-related yet. 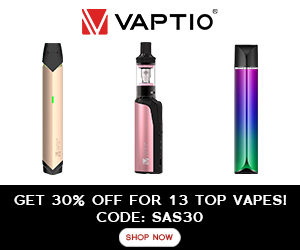 Where other companies have fallen and crumbled (blame the TPD), Vapour2 has flourished, and they now have a pretty impressive array of vape devices for most types of vapers. After taking everything into consideration, I would find it very difficult to rate this V2 Cigs Ex Series review with any less than five stars out of five. I’m very impressed. It’s my new favourite e-cigarette! *when compared to what else is on the market now. *Prices & information correct at time of writing/update. HONESTY POLICY: The V2 Cigs Ex Series Kit + extras were sent to me for review by V2 Cigs/Vapour2. I did not pay for these products. I was not paid for my review, and I will not be paid for my review. All opinions are mine, and in no way influenced by the brand/manufacturer. Previous: Brand New! Smokio ECigarette! Next: New! JacVapour Series-B Announced! Do u sell ex v2 kit? If you use the discount code: UKWORDGIRL, you’ll also get 10% off your order. Hey – thanks for this great review. I tried the V2 starter kit out, and am hugely impressed so far. The review could do with a little update re: pricing (i.e. pack of 5 carts now 13.95), but other than that I found it spot on, and agree with your comments. I’m glad you liked the V2 Starter Kit too. I’ve tried almost all of their products now and I’ve never been disappointed. They were one of the very first brands I tried, and I still have a lot of the batteries, etc. even now – a couple of years later. Also glad the discount code came in handy. Thanks so much for letting me know what you thought! I’m still vaping with V2, some 15 months after my last message, so thanks a lot! I’ve found V2 to be incredibly reliable. Their deliveries via APC are always spot on time. The batteries last a couple of months, then I have to buy new ones, or otherwise I end up with ‘Vapour’s Tongue’. My fav flavour is ‘Congress’, but I also keep some ‘Red’ in stock. Those are really good e-cigs. Honestly maybe the best I tried. I’m pleased with the way they look and how easy they are to set up and use. When I was choosing which colour to buy (I know that the colour of your e-cig is not the most important thing in the world but for me it kind of is) What I also like about those e-cigs are the flavours of the cartridges. Menthol and cherry are my favourites but I like to switch up from time to time just to have fun and that is something I can do with Vapour 2.